Either: You’re logged out, so you’re just an anonymous visitor to your WordPress site. Or: You’ve enabled User Cache on the Cache tab, so WP Rocket will create a dedicated cache for logged-in users on your site. Not seeing a footprint? Are you perhaps using Cloudflare? Cloudflare’s HTML minification would remove the footprint. This means that WP Rocket’s file optimization is working; usually, the page would also be cached. Wappalyzer is a free service that lets you identify technology on websites. You’d just install one of their browser extensions that will show you if WP Rocket is running on a website. 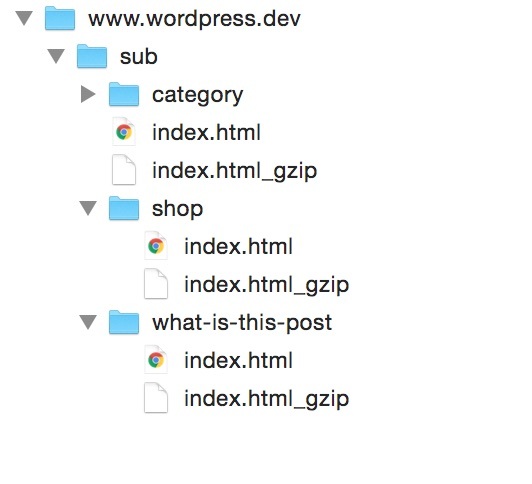 Using either (S)FTP, or your web host’s file manager panel, you can visit the cache folder in your WordPress install directly, and make sure that cache files are generated correctly. Make sure you’re logged out, then visit several pages on your site, so they get cached. Inside of that folder, you should see a folder named like your domain. This is the folder where you should find cached .html and/or .html_gzip files, along with folders for each page on your site. These are the cache files. Caching doesn’t work, now what?